Get Online Best Quality IP PTZ CCTV Camera in Delhi India from our Spy Products Store in Delhi, Buy Cheap Price IP PTZ CCTV Camera, CCTV Security System, CCTV Camera, Indoor CCTV Camera, Outdoor CCTV Camera, IR CCTV Camera in Delhi India and We are Best Dealers of CCTV Camera in Delhi India and all over world. We are offering an exclusive range of PTZ speed dome cameras that have been produced using superlative materials that facilitate creation of clear images with suitable resolution. 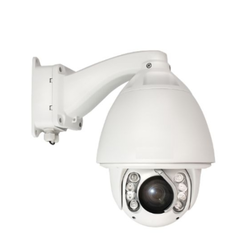 These PTZ speed dome cameras are futuristic electronic gadgets that are widely sought after for their durability, efficiency, effectuality. 1/2.9 2Megapixel progressive CMOS H.264+ & H.264 dual-stream encodingDWDR, Day/Night(ICR), 3DNR, AWB, AGC, BLC3.6/6mm Lens, IR Range of 30m, & POE.Multiple Network Monitoring, Web viewer, CMS(DSS/PSS)IP67 & Weather Proof Housing. We are Interested in Enquiries Mainly From North Maharashtra Region Comprising of Nashik, Dhule, Jalgaon & Nandurbar Districts : Malegaon, Manmad, Sinner, Igatpuri, Pimpalgaon, Ojhar, Dindori, Bhusawal, Chalisgaon, Shirpur and Other Nearby Areas of Nashik City. We offer Speed Dome Camera & PTZ Camera. - 1/4 inch sony ccd. - 75°/s pan preset speed and 50°/s tilt preset speed. - 0. 2-75°/s manual pan speed and 0. 3-50°/s manual tilt speed.